RENÉ....this oldie bear has been created from a short mohair which has been hand dyed and antiqued to give it that aged look - I have done a lot of aging to achieve that cared for and out of the attic style. RENÉ....has hand dyed flannel fabric for the foot and paw pads, a wobbly head with genuine black boot button eyes, a perle cotton sewn nose, loose split pin jointing and top quality pure wool fill with smooth glass beads to give a nice weighty feeling to the bear. RENÉ.... wears a stained collar and cap. He comes with his companion a green glass frog. Please note that everything else in the picture is NOT included or for sale. REMY....this oldie has been created from a sparse mohair which has been hand dyed and antiqued to give it that aged look. I have done a lot of aging to achieve that much loved - cared for and out of the attic look. REMY....has hand dyed flannel fabric for the foot pads, a wobbly head with genuine black boot button eyes, a perle cotton sewn nose, loose split pin jointing and top quality pure wool fill with smooth glass beads to give a nice weighty feeling to the bear. REMY.... wears a stained ruff and a vintage style locket. He comes with his companion a green glass frog. Please note that everything else in the picture is NOT included or for sale. PIPKINS....this oldie bunny/bear has been created from a short mohair which has been hand dyed and antiqued to give it that aged look and I have done a lot of aging to achieve that cared for and out of the attic style. PIPKINS....has hand dyed flannel fabric for the foot pads and the inside of the ears, a wobbly head with genuine black boot button eyes, a perle cotton sewn nose, loose split pin jointing and top quality pure wool fill with smooth glass beads to give a nice weighty feeling to the bear. PIPKINS.... wears stained overalls and a knitted beret. He comes with his companion a green glass frog. Please note that everything else in the picture is NOT included or for sale. Sorry I've been Adopted ! BRUNO....this oldie has been created from a short pile mohair which has been hand dyed and antiqued. I have done a lot of aging to achieve that much loved - cared for and out of the attic look. BRUNO....has hand dyed flannel fabric for the foot pads, a wobbly head with genuine black boot button eyes, a perle cotton sewn nose, loose split pin jointing and top quality pure wool fill with smooth glass beads to give a nice weighty feeling to the bear. BRUNO.... wears a one-off leather collar and satchel. He comes with his companion a green glass frog. Please note that everything else in the picture is NOT included or for sale. ALEX....this oldie has been created from a short crushed pile mohair hand dyed and antiqued. I have done a lot of aging to achieve that much loved - cared for and out of the attic look. ALEX....has hand dyed flannel fabric for the foot pads, a wobbly head with genuine black boot button eyes, a perle cotton sewn nose and loose split pin jointing with top quality pure wool fill and smooth glass beads to give a nice weighty feeling to the bear. ALEX.... wears a one off vintage style waistcoat and knitted scarf. He comes with his companion a green glass frog. Please note that the old style clock is NOT included or for sale. SUZETTE....this oldie has been created from a felted pile mohair hand dyed and antiqued in a lovely vintage shade of pale honey and cookies colours. I have done a lot of aging to achieve that much loved - cared for and out of the attic look. SUZETTE....has vintage flannel for the foot and paw pads, has black genuine boot button eyes, a perle cotton sewn nose, loose split pin jointing and top quality pure wool fill with smooth glass beads to give a nice weighty feeling to the bear. SUZETTE.... wears a vintage style and aged outfit. She comes with her companion a Murano glass frog. Please note that the box is NOT included or for sale. CAMILLE....this oldie has been created from a slightly crushed short pile mohair hand dyed and antiqued in a lovely vintage shade of cloud white colour. I have done a lot of aging to achieve that much loved - cared for and out of the attic look. CAMILLE....has vintage flannel for the foot and paw pads, black genuine boot button eyes, a perle cotton sewn nose, loose split pin jointing with top quality pure wool fill and smooth glass beads to give a nice weighty feeling to the bear. CAMILLE.... wears a vintage style stained skirt and sweater and attached to the sweater is an old vintage brooch. She comes with her companion a Murano glass frog. Please note that the old tray of sewing bits and pieces are NOT included or for sale. PEPPI....this oldie has been created from a short crushed pile mohair hand dyed and antiqued in a lovely vintage shade of blueberrry and a light stone colours. I have done a lot of aging to achieve that much loved - cared for and out of the attic look. PEPPI....has vintage flannel fabric for the foot and paw pads, a wobbly head with genuine black boot button eyes, a perle cotton sewn nose, loose split pin jointing with top quality pure wool fill and smooth glass beads to give a nice weighty feeling to the bear. PEPPI.... wears a vintage style ruff and hat. He comes with his companion a Murano glass frog. Please note that the old clock is NOT included or for sale. LESTER....this oldie has been created from a short crushed pile mohair hand dyed and antiqued in a lovely vintage shade of rich golden honey colour. I have done a lot of aging to achieve that much loved - cared for and out of the attic look. LESTER....has hand dyed flannel fabric for the foot and paw pads, a wobbly head with genuine black boot button eyes, a perle cotton sewn nose, loose split pin jointing and top quality pure wool fill with smooth glass beads to give a nice weighty feeling to the bear. LESTER.... wears an aged shirt and a knitted beret. He comes with his companion a Murano glass frog. Please note that the vintage tray of sewing notions are NOT included or for sale. CLYDE....this oldie has been created from a short crushed pile mohair hand dyed and antiqued in a lovely vintage shade of a silvery lilac colour. I have done a lot of aging to achieve that much loved - cared for and out of the attic look. CLYDE....has hand dyed flannel fabric for the foot and paw pads. He has a wobbly head with genuine black boot button eyes, a perle cotton sewn nose, loose split pin jointing and top quality pure wool fill with smooth glass beads to give a nice weighty feeling to the bear. CLYDE.... wears an aged neck ruff and hat. He comes with his companion a Murano glass frog. Please note that the old antique books are NOT included or for sale. GRANBY....this oldie has been created from a short crushed pile mohair hand dyed and antiqued in a lovely vintage shade of coco colour. I have done a lot of aging to achieve that much loved - cared for and out of the attic look. GRANBY....has vintage flannel fabric for the foot and paw pads, a wobbly head with genuine black boot button eyes, a perle cotton sewn nose, loose split pin jointing and top quality pure wool fill with smooth glass beads to give a nice weighty feeling to the bear. GRANBY.... wears a vintage style aged pants and scarf. 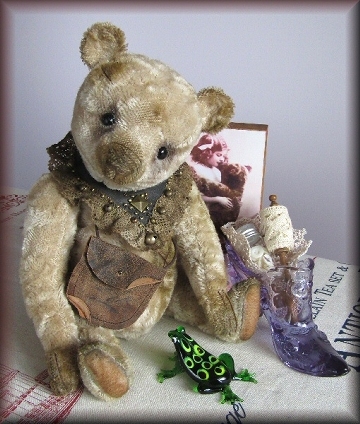 He comes with his companion a Murano glass frog. Please note that the old can is NOT included or for sale. MARTHA....this oldie has been created from a crushed style pile mohair hand dyed and antiqued in a lovely vintage shade of lilac and a silver grey colours. I have done a lot of aging to achieve that much loved - cared for and out of the attic look. MARTHA....has vintage flannel for the foot and paw pads, genuine black boot button eyes, a perle cotton sewn nose, loose split pin jointing with top quality pure wool fill and smooth glass beads to give a nice weighty feeling to the bear. MARTHA.... wears a vintage style ruff with an old vintage brooch and a crocheted vintage style cloche hat. She comes with her companion a Marano glass frog. Please note that the old weighing scales are NOT included or for sale. DUKE....this oldie has been created from a short crushed pile mohair hand dyed and antiqued in a lovely vintage shade of rusty brown and a light honey gold. I have done a lot of aging to achieve that much loved - cared for and out of the attic look. DUKE....has vintage flannel fabric for the foot and paw pads, a wobbly head with genuine black boot button eyes, a perle cotton sewn nose, loose split pin jointing and top quality pure wool fill and smooth glass beads to give a nice weighty feeling to the bear. DUKE.... wears a vintage style leather collar and hat. He comes with his companion a Murano glass frog. Please note that the old honey pot and brick are NOT included or for sale. HOBO....this oldie has been created from a short crushed pile mohair hand dyed and antiqued in a lovely vintage shade of milky chocolate colour. I have done a lot of aging to achieve that much loved - cared for and out of the attic look. HOBO....has faux leather looking fabric for the foot and paw pads, a wobbly head with genuine black boot button eyes, a perle cotton sewn nose, split pin jointing with top quality pure wool fill and smooth glass beads to give a nice weighty feeling to the bear. HOBO.... wears a vintage style old coat and cap. He comes with his companion a Murano glass frog. Please note that the old metal box is NOT included or for sale. DANDY....this oldie has been created from a short crushed pile mohair hand dyed and antiqued in a lovely vintage shade of champagne colour. I have done a lot of aging to achieve that much loved - cared for and out of the attic look. DANDY....has flannel fabric for the foot and paw pads, a wobbly head with genuine black boot button eyes, a perle cotton sewn nose with loose split pin jointing and top quality pure wool fill with smooth glass beads to give a nice weighty feeling to the bear. DANDY.... wears a ruff and a steampunk style top hat with vintage pieces. He comes with his companion a Murano glass frog. Please note that the old books are NOT included or for sale. VERA....this oldie has been created from a crushed style pile mohair hand dyed and antiqued in a lovely vintage rich honey colour. I have done a lot of aging to achieve that much loved - cared for and out of the attic look. VERA....has suede flannel for the foot and paw pads. She has black genuine boot button eyes, a perle cotton sewn nose, loose split pin jointing and top quality pure wool fill with smooth glass beads to give a nice weighty feeling to the bear. VERA.... wears a vintage style dress with an old vintage brooch attached and a crocheted head band. She comes with her companion a Murano glass frog. Please note that the old box is NOT included or for sale. NORTON....this oldie has been created from a short sparse felted mohair which has been hand dyed and antiqued in lovely light coffee colour. I have done a lot of aging to achieve that much loved - cared for and out of the attic look. NORTON....has flannel fabric for the foot and paw pads, a wobbly head with genuine black boot button eyes, a perle cotton sewn nose, loose split pin jointing and top quality pure wool fill with smooth glass beads to give a nice weighty feeling to the bear. NORTON.... wears a vintage style jacket and hat with a vintage button. He comes with his companion a Murano glass frog. Please note that the old clock is NOT included or for sale. ENZO....this oldie has been created from a short crushed pile mohair hand dyed and antiqued in a lovely vintage shade of silver for the head and a vintage shade of Aqua for the body. I have done a lot of aging to achieve that much loved - cared for and out of the attic look. ENZO....has flannel fabric for the foot and paw pads, a wobbly head with genuine black boot button eyes, a perle cotton sewn nose, loose split pin jointing and top quality pure wool fill with smooth glass beads to give a nice weighty feeling to the bear. ENZO.... wears a scarf with a vintage button and a beret also a vintage leather pouch . He comes with his companion a Murano glass frog. Please note that the old rocking horse is NOT included or for sale. ANDY....this oldie has been created from a short sparse pile mohair which has been hand dyed and antiqued in lovely light creamy honey colour. I have done a lot of aging to achieve that much loved - cared for and out of the attic look. ANDY....has flannel fabric for the foot and paw pads, a wobbly head with genuine black boot button eyes, a perle cotton sewn nose, loose split pin jointing and top quality pure wool fill with smooth glass beads to give a nice weighty feeling to the bear. ANDY.... wears a vintage style ruff and hat with a vintage pin. He comes with his companion a Murano glass frog. Please note that the tin box is NOT included or for sale. JACKO....this oldie has been created from a curly pile mohair which has been hand dyed and antiqued in lovely silvery blue with a slight hint of green. I have done a lot of aging to achieve that much loved - cared for and out of the attic look. JACKO....has flannel fabric for the foot and paw pads, a wobbly head with genuine black boot button eyes, a perle cotton sewn nose, loose split pin jointing and top quality pure wool fill with smooth glass beads to give a nice weighty feeling to the bear. JACKO.... wears a vintage style ruff and hat. He comes with his companion a Murano glass frog. Please note that the box egg is NOT included or for sale. JANGLES....this oldie has been created from a short crushed pile mohair hand dyed and antiqued in a lovely vintage delicate shade of silver with a hint of sage colour. I have done a lot of aging to achieve that much loved - cared for and out of the attic look. JANGLES....has flannel fabric for the foot and paw pads, he has a wobbly head with genuine black boot button eyes, a perle cotton sewn nose, loose split pin jointing and top quality pure wool fill with smooth glass beads to give a nice weighty feeling to the bear. JANGLES.... wears a vintage style ruff and hat. He comes with his companion a Murano glass frog. Please note that the Christmas trees are NOT included or for sale. JINGLES....this oldie has been created from a short crushed pile mohair hand dyed and antiqued in a lovely vintage delicate shade of silvery grey colour. I have done a lot of aging to achieve that much loved - cared for and out of the attic look. JINGLES....has flannel fabric for the foot and paw pads, a wobbly head with genuine black boot button eyes, a perle cotton sewn nose, loose split pin jointing and top quality pure wool fill with smooth glass beads to give a nice weighty feeling to the bear. JINGLES.... wears a vintage style velvet jacket and a knitted beret with a gold tassle. He comes with his companion a Murano glass frog. Please note that the old rocking horse is NOT included or for sale. JASPER....this oldie has been created from a short sparse pile mohair hand dyed and antiqued in a lovely rose beige colour. I have done a lot of aging to achieve that much loved - cared for and out of the attic look. JASPER...has suede flannel fabric for the paw pads and foot pads, a wobbly head with genuine black boot button eyes, a perle cotton sewn nose, loose split pin jointing and top quality pure wool fill with smooth glass beads to give a nice weighty feeling to the bear. JASPER.... wears a stained vintage style ruff and hat. He comes with his companion a Murano glass frog. Please note that the old ceramic pots are NOT included or for sale. TOMMY....this oldie has been created from a curly felted pile mohair in a lovely rich golden colour which has been antiqued and aged. I have done a lot of aging to achieve that much loved - cared for and out of the attic look. TOMMY....has pure wool felt for the foot and paw pads, a wobbly head with black genuine boot button eyes, a perle cotton sewn nose, loose split pin jointing, top quality pure wool fill and smooth glass beads to give a nice weighty feeling to the bear. TOMMY.... wears a knitted scarf and a cap made out of wool fabric. He comes with his companion a Murano glass frog. Please note that the old wooden blocks are NOT included or for sale. JILLAROO....this oldie has been created from a crushed style pile mohair hand dyed and antiqued in a lovely vintage old fashion light beige colour. I have done a lot of aging to achieve that much loved - cared for and out of the attic look. JILLAROO....has suede flannel for the foot and paw pads, genuine black boot button eyes, a perle cotton sewn nose, loose split pin jointing and top quality pure wool fill and smooth glass beads to give a nice weighty feeling to the bear. JILLAROO.... wears a aged vintage style dress - the hat is in a similar style to a Jillaroo's hat with a tigers eye cabochon on the side. She comes with her companion a Marano glass frog. Please note that the old scales are NOT included or for sale. PERRY....this oldie has been created from a curly pile mohair and antiqued in lovely stone and black colours. I have done a lot of aging to achieve that much loved - cared for and out of the attic look. PERRY....has flannel fabric for the paw pads, the original rexine fabric for his foot pads, a wobbly head with genuine black boot button eyes, a perle cotton sewn nose, loose split pin jointing and top quality pure wool fill and smooth glass beads to give a nice weighty feeling to the bear. PERRY.... wears a vintage style ruff and hat. He comes with his companion a Murano glass frog. Please note that the old rocking horse is NOT included or for sale.